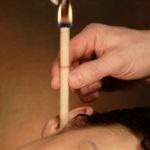 The VTCT Level 2 Award in Thermal Auricular Therapy training course is a specialist qualification that has been designed to help develop your basic knowledge and practical skills in how to provide ear candling treatments on clients. The purpose of this qualification is to develop your skills and knowledge of the complementary therapy or beauty industry and allow you to progress to a larger course of learning leading to a certificate or diploma qualification. You will cover health and safety and client care along with the practical skills required to treat a client professionally. This qualification will allow you to obtain insurance. Alternatively this course is an ideal Continual Professional Development training for those already qualified in other therapies and already practising within the complementary therapy or beauty industry. This VTCT qualification has no prerequisites. The course includes five* days classroom based training and you will also be required to undertake some guided home study outside these hours. To complete the qualification you are required to sit one external exam paper set by VTCT and successfully complete three practical assessments, the time for the completion of these elements is included in the five days. * Qualified therapist or Beautician? If you already hold a level 2 or 3 recognised qualification in either beauty or complementary therapies then the training can be done in two days which will cover practical training, three assessments and the completion of one external exam paper set by VTCT. Some guided home study will be required outside these hours. Flexible training terms are available, so please contact us to discuss your requirements. £395 (inc VAT) which includes a VTCT registration fee, course materials and multiple choice exam paper. *£195 (inc VAT) for two day course if you already hold a complementary therapy or Beauty qualification. The next two day course will be run on 1 May 2019 and 15 May 2019. Places are limited so please do get in touch to book your place if you are interested in this course. Error: Error validating access token: Session has expired on Monday, 15-Apr-19 01:34:43 PDT. The current time is Tuesday, 23-Apr-19 19:08:43 PDT.